Das Anwesen befindet sich in den Hügeln von Bridgehampton, eingebettet auf sechs Hektar Wald zwischen dem Dorf Bridgehampton und der Stadt Sag Harbor. Das Haus liegt in einer privaten kurvenreichen Auffahrt etwa 800 m von der Hauptstraße entfernt. Das Haus ist ein 7.200 m² großes, klassisch geplantes Bauernhaus, umgeben von einer wunderschönen Landschaft. Das Anwesen verfügt über sieben Schlafzimmer mit entweder Queen-oder Full-Size-Betten, jedes mit eigenem Marmorbad, Kochküche mit Viking-Geräten, formelles Wohnzimmer mit Kamin, formelles Esszimmer, Waschmaschine / zwei Trockner, Garage für drei Autos mit viel Parkplatz, sechs Satellitenfernseher mit Premium-Sendern, DVD, CD, Videorecorder und Sony Play Station II, hochmodernes Fitnessstudio mit Zirkeltraining, Spielzimmer mit Billardtisch und Tischkicker, frei geformter beheizter Gunite-Pool mit blauer Steinterrasse , Whirlpool für acht Personen mit Wasserfall, Allwetter-Tennisplatz und Basketballplatz. Rick's property is truly a gem. With the long driveway to the house, you feel like you're on your own little island in Long Island! All of the beds were very comfortable with enough towels for all the guests. Rick was very helpful throughout the entire weekend and always available for any questions. The house is truly perfect for a large group getaway. We will definitely be back!! The house was exactly as described, and the owner was amazing. The house is easy to get to via Google Maps, so don’t use Apple maps. Other than that, everything was perfect. The house has plenty of kitchen items for the guests, and was clean and perfectly equipped. The Sonos throughout the house is a perfect addition, and we’ll definitely rent again. First time using VRBO and could not have asked for a better experience. The home is something else and exceeded my expectations. Everything we could have asked for - spacious, comfortable, spotless and everything seemed to be new or recently updated. Rick was very responsive and accommodating. We rented this lovely home few couples with kids for the week prior to labor day, the rooms are spacious with full bath and a nice closet in each bedroom , each family had their own privet space . 2 living rooms and huge kitchen well equipped with anything u might need. Great warm swimming pool . And overall a well kept house that easily accommodated all our needs adults and kids..
Rick was very patient and informative, Taking the extra mile to fit our needs. 7 families stayed here for the week. 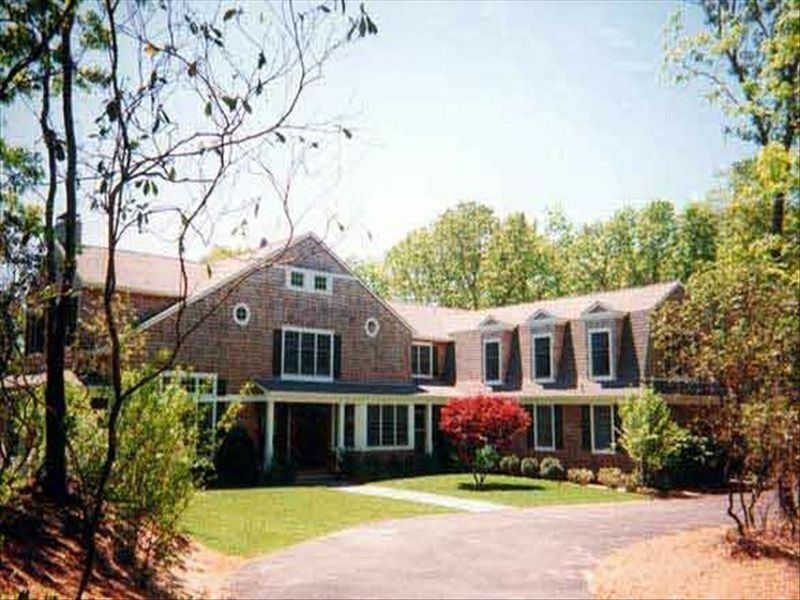 This 7 bed 7 bath home was perfect as each family had their own private bath. "R" was very responsive to all my questions. He even offered to purchase a ping pong table for the house when I mentioned we enjoyed playing. We were a little surprised of the late 6pm check-in (was written on the lease but didn't notice till week before). But with the later 1pm checkout, I guess it was needed for time to clean. I thought the house looked like red brick from the website photo, but it was actually gray. We arrived at 6:30pm and the housekeeper was still there finishing up the laundry. The rest of the photos of the home were accurate. It was very spacious and clean. There were a few cracks in the kitchen tile floor, and other minor issues we reported to "R". The outdoor pool was nice and had speakers to play music. It did get a little dirty with bugs and leaves because it was in the woods. The bbq was very large and in good condition. We had fun playing tennis on the hard courts, which were also in good condition. We had a few balls go over the fence into the woods. The kitchen was beautiful and large with lots of counter and cabinet space. The kitchen was well stocked with lots of serving dishes, blender, pots and pans, coffee maker, outdoor grilling utensils, plates, etc. It was nice the rooms were large and spread out. Had fun playing Taboo game that was at home. The finished basement was small relative to home. It had a pool table and fooseball table. There was a nice big washing machine and two dryers. The gym was fantastic and better than most hotels we stayed in. It had a great universal machine to work both the legs and upper body. It looked very new and in good condition. The Wifii at the house worked well. The house was very sound proof. "R" was very responsive when I texted him of any issues we had during our stay. He replied quickly, and had sent his caretaker out to fix a broken door handle for us. Everyone in our large group enjoyed the house and all of it’s amenities. The house was in a great location, about 15 minutes from Sag Harbor, 15 minutes from Bridgehampton, 20 minutes to East Hampton, and 1 hour from Montauk. Only suggestion I had was I think it would have been helpful if "R" emailed all the house specifics on his own several weeks in advance instead of the week before. Thanks "R" for letting us stay at your beautiful home. I was looking for a house in the Hamptons with a Tennis Court for a getaway with my family. We found this amazing house and Rick was very accommodating. I also have a house on VRBO so I am very aware how a house should be run and how a landlord should interact. Everything was great. The house is very comfortable and relaxing. We are thinking of coming back next year and highly recommend this property. Ideal gelegen zwischen den Dörfern von Southampton, Bridgehampton, East Hampton, Sag Harbor und Shelter Island gelegen, ist das Gebäude, sehr günstig in der Nähe von Flying Point Beach, Coopers Beach, Main Beach, Agawam Park, Parrish Art Museum, Monument Square, Montauk Downs Golf Course, Shelter Island Country Club, Poxabogue Golf Course, Bridgehampton Tennis Club, Morton National Wildlife Refuge, Long Pond Greenbelt, Cedar Point Country Park, Long Wharf Marina und Dering Harbor Marina. Genießen Sie Reiten am Strand, Golfen, Segeln, Segeln, Jet-Ski, Wandern, Schwimmen, Antiquitäten, feines Essen und Clubbing in Manhattans angesagtesten Clubs East End Außenposten. Zwei kurzen Fährfahrten werden Sie auf Long Island, North Fork Weinland zu bekommen. A contract will be sent for signing prior to arrival date.